Cloudbursts are usually triggered by mountain formations that lead to lifting of moisture-laden winds and forming of a convective cloud. Cloudbursts are common in the western Himalaya. Western disturbances over the Leh region on August 5 might have also triggered the cloudburst, said M Rajeevan, of National Atmospheric Research Laboratory, Tirupati. A cloudburst in Ladakh is unnatural because it is a rain shadow area. But officials of the India Meteorological Department in Delhi said it is not the first time Leh experienced a cloudburst. Experts said the cloudburst cannot be directly linked with climate change, but increase in the number of extreme weather events is because of climate change. Areas beyond Himalayas were considered rain shadow. Normally the cold air from those places kept the warm air pressed and the monsoon clouds could not travel beyond Himalayas. But since the Global warming and glacial melt down the air in the Himalayas also became slightly warmer thereby loosing its ability to keep the warm air checked by the mountain ranges. A small amount of rain bearing clouds are now able to sneak past the mountains and gets sucked into the local low pressure areas. Remember that Himalayan plateau is also notorious for being too hot in the day time and too cold in the night time especially in the summer. So far these differences did not pose a problem because the air was dry. But now with some monsoon clouds getting mixed in this huge variation of temperature the results that are likely to produce is beyond some body's comprehension. We can only apprehend that the earth getting warmer more and more rain bearing clouds will get drifted into the Himalayas and beyond. Hi, The Cloudburst in Leh is becoming a little challenge for the weather scientists. But the evidences on the ground now suggests that the Cloudburst was not over a large area or on a range of mountains as thought earlier but the downpour was confined to an area less than 100 sq meters, at least at Leh. Everything happened in less than 1 hour, there was not much rain to talk about before or afterward.As per the eye witnesses, the amount of rain water at the time of the downpour was about 'two storey'. But the force of the water was such that it sent some concrete pillars flying and hitting houses across 100 meters sideways in such a way that they are almost fused. It can still be seen. Scientists must visit all these areas, climb the hills and mountain tops where the cloudburst has stuck and also talk to people rather than making a half baked assessments, because the actual events seems to differ from their explanations. Newswalahs are also making mistakes for the names of the places. 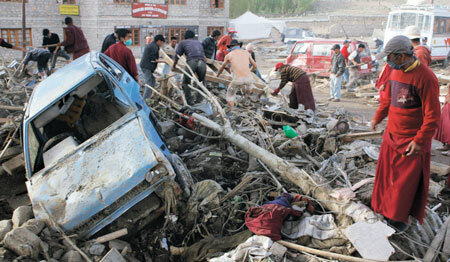 It was not "OLD LEH" where the deluge washed away houses. Where was it then? Just go there and find out!